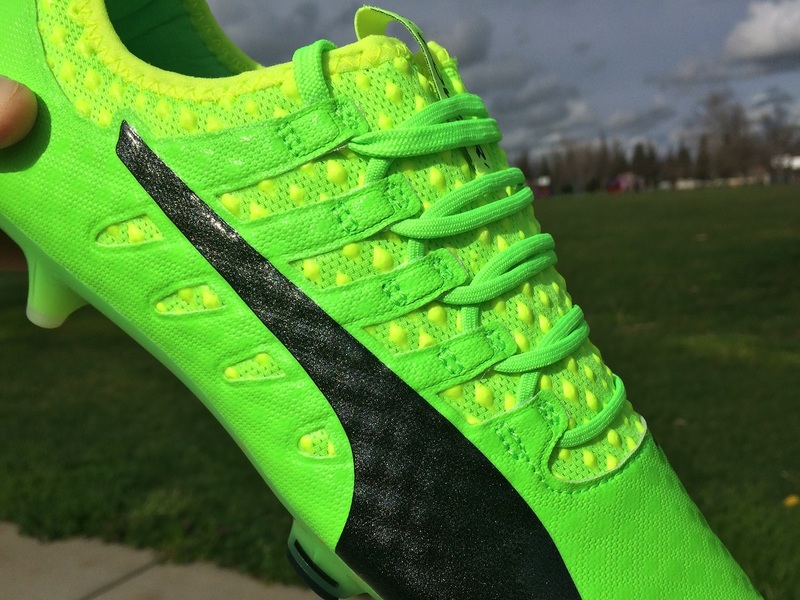 Over the past few years, Puma’s evoPOWER series has become one of the most influential on the market. Things couldn’t have started any better than the original evoPOWER release, and what turned out to be 2014 boot of the year. The second edition took things back a step, but Puma listened to player feedback and went back to the basics with the evoPOWER 1.3. This latest release, the evoPOWER Vigor 1, illustrates Puma’s desire to push boundaries and create something completely fresh and revolutionary. “Made for the powerful, but engineered for accuracy”; that is how Puma has described this latest release, and it really is anything but ordinary. I’ve had the opportunity to start with the Camo evoPOWER and then evolve to the original release colorway – as pictured – for testing, and one thing has been apparent; these boots have somthing special! You can find the evoPOWER Vigor 1 available at soccer.com. There is a distinctly new feel about the evoPOWER Vigor, as Puma take the series in a fresh new direction for the first time. This time around, the focus is on improved touch and a more uniform power element right across the surface of the boot, rather than in specific areas. A spandex sock also adds a completely new type of performance. In essence, this is a completely new type of power boot that should prove very fun to test! From my experience, and a medium to wide fit, I found them to be very comfortable through wear. I took them out of the box and into an indoor game with no problems. The first thing I did was completely loosen the laces, allowing the spandex through the tongue region to have a looser feel. This made it easy to slip my foot in. What is unique about these boots compared to similar tongueless style boots, like the Nike Vapor X or XI for example, is that you couldn’t wear them without tying the laces. They would simply fall off your feet as the spandex is not intended to be ultra constrictive. It has some give, but not enough to lock you down. As a result, I tightened the laces and the experience was a joy. One of the really cool things about these boots is the way in which they are constructed. Basically, the entire upper is a Spandex sock with extra pieces attached to it. The sock is the core piece of the boot, what you slip your foot into and what helps define the how your foot molds with the entire shoe. When you look at the boot, it is the area green region that has yellow diamond shapes covering its surface. Given that is is spandex, you won’t be surprised to hear that it has an elastic feel, with plenty of stretch throughout. The synthetic AdapLite that covers the forefoot, around the side walls and heel of the boot is what provides the boots structure. One of the first things you will notice about the Vigor is the fact this is a boot that features a slip on design, that is created by the new sock lining. As you put the boots on for the first time, you need to use the pull tabs and squeeze your foot in, so there is some tightness. But, they end up being very easy to slip in and out of as the spandex is not intended to be ultra constrictive. The lip of the ankle cut is very unusual. In order to give the Spandex shape around the ankle, they use a built in layer of material that acts like a cuff would on a knitted shirt. It basically caps the material, ensuring strands don’t fall loose or go too loose during wear. From my experience, it lines the ankle nicely, but not in the same form as a dynamic fit. In fact, I found that it didn’t hug my entire ankle, leaving some additional room for players with a larger ankle. What really helps is the additional padding placed inside the boot, surrounding the ankle. The thicker areas help produce a more locked in fit, and it all really does come together well. On top of the boot lies AdapLite, a material with stretch properties and the intention to give the boot shape, form and proper function. Without it, you’d basically be wearing an entire sock with the little pieces of 3D grip material. In other words, it has a real role to play in the boots performance! AdapLite is very pliable for a synthetic material. It isn’t quite as soft as a leather, but it does fold very naturally under your fingers. 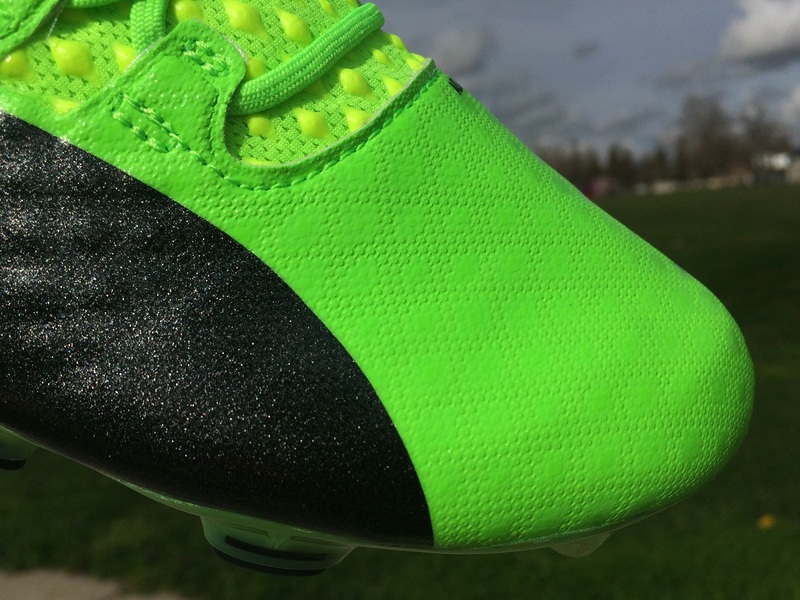 Puma has added a micro texture across the surface, just enough to make an impact when it comes to touch on the ball. Puma advertise it as being ready for all weather conditions; I see that as true but not to the extent that you’d get with a leather or a purposely textured upper like the adidas Purechaos. To date, I’ve found the upper to be very durable with little to no scuffing. So, I feel like these are going to be durable over extended play. Having a double layered upper – with Spandex and AdapLite – the materials sort of mesh together to increase strength. 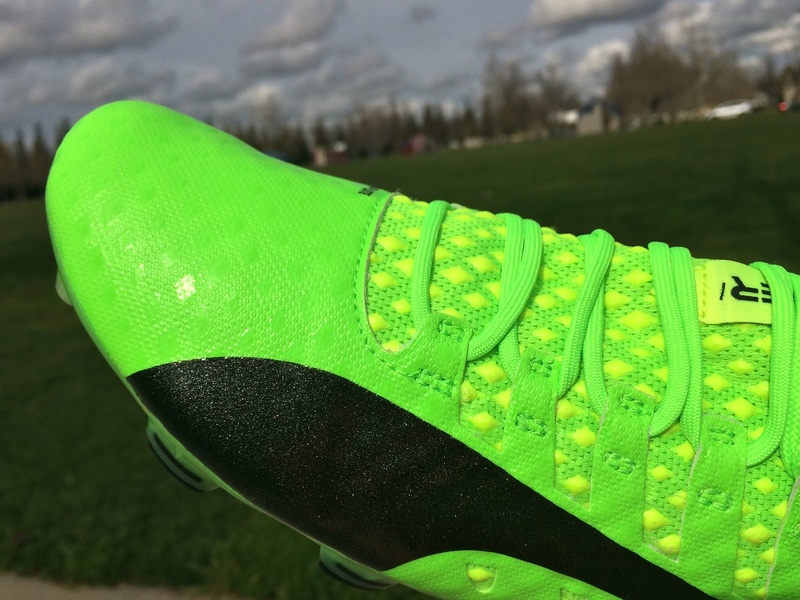 If you are a Puma fan, you will be familiar with the term AccuFoam. This is the material used through the strikezone of previous Puma boots, it is like a memory foam material that provides increased energy release, or rebound, as you strike shots. 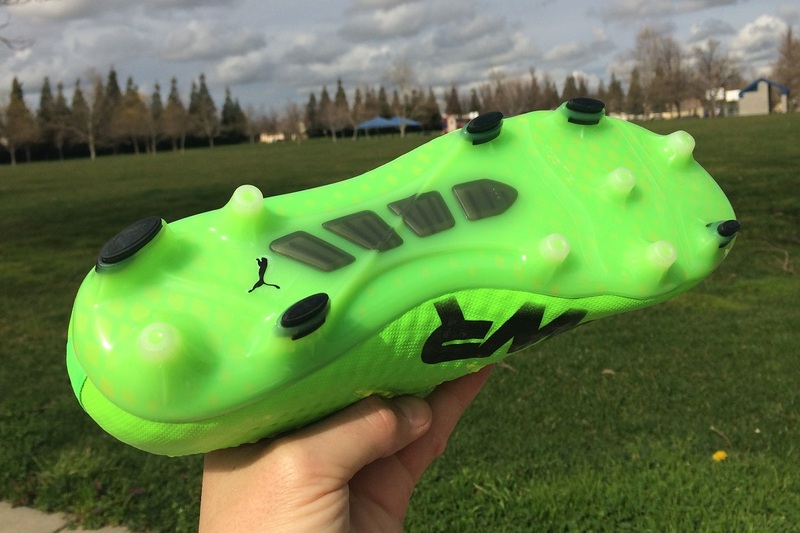 Here, Puma use many 3D dots right across the upper as a tool to ensure the boot is still seen to be a power boot. What makes it even more intriguing is the fact the AccuFoam material actually lines the outside of the boot in some areas, and inside in others. Right through the forefoot, the AccuFoam dots actually lie INSIDE the boot, against your sock and toes. It is almost like Puma has melted the dots right through the upper Spandex material, creating double the performance benefits. Not only do the dots add to the rebound on shots, but they also add a layer of grip between your sock and the upper material, keeping you securely locked in with little movement through wear. The purpose of the dots is to add additional power behind strikes, without taking away from first touch on the ball. You are still supposed to have more of a barefoot feel as you take touches and move around the pitch with the ball at your feet. Because they are exposed around the lacing area, they also give you a little more tackiness on the ball, again helping with keeping close control. Does it work? I’d have say my experience with the 3D, when coupled with the Spandex sock and AdapLite upper material was very positive. I really enjoyed how they felt on the ball. You get a clean touch and some additional grip without losing out on natural touch. Because the SD dots line the tongue and lacing are, you get the most benefit when striking shots. Across the forefoot, AdapLite provides the primary connection with the ball and that is definitely different. Here lies the gift that keeps on giving, as Puma stick with a soleplate that has been a proven winner since the introduction of the range. Many times, brands will look to change things up as they move to a new silo, just to keep things “fresh”. But sometimes, it is better to stick with something that fans appreciate. Here, that would definitely be the case, with the super flexible StabilityFrame outsole providing excellent flex and energy release. What you are getting is essentially a feel that is as close as possible to the bio-mechanics of the bare foot, replicating its natural power. In the past, this is an aspect of the boot I’ve been a huge fan of, and again I heavily approve of its inclusion. Note here that there is no elevated spine through the midfoot like on previous models, Puma has toned things down ever so slightly and the results feel very similar in play. You still get the support you need, while they prove to be very explosive when striking shots. This is an interesting boot in terms of size and shape. First thing to note is the heel, where Puma has gone with a rounder style design that is a lot more accommodating than other standard boot releases. What works well with the rounded style is the padding lining the inner ankle. Because the lining is a softer material, it responds to your ankle shape and provides more of a locked down effect for players with a thinner heel. If you do have a thin heel, they might not work so well. In terms of length, I found them to be a typical true to size “Puma” boot. By that, I mean they are slightly snug through the forefoot, but the stretch in the upper materials allows for some additional room. Basically, you can mold your own foot shape through wear, but note that they are snug across the top of your foot through wear. The material will stretch, but it only stretches to your size meaning you will always have them layered tightly with your forefoot. 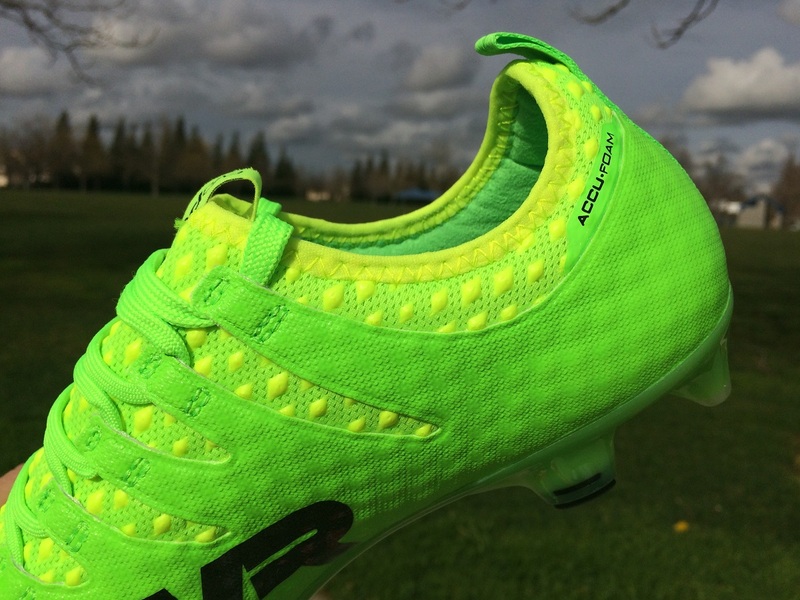 Width wise, the evoPOWER has a reputation for being a wide fitting option through their existence, but that changes here. These don’t have that same luxury, and I’d place them in more of a medium to wide fitting category. If you can try on a pair before purchasing, I’d definitely recommend it. Is This a Power Boot? 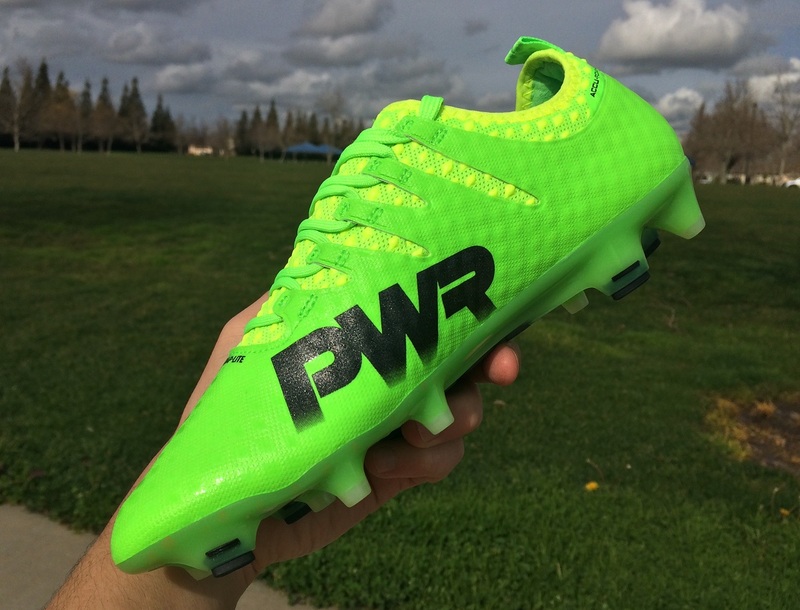 The evoPOWER series has continually been a top power option for players. In fact, of the big 3 (adidas, Nike, Puma) this range is the last remaining power boot. But this time around, things are just a little different. Yes they still hold the power element, but there is a more sophisticated aura about these. The AccuFoam 3D dots kind of turn them into a playmaker style boot, where the additional padding creates a cleaner touch without impacting overall feel on the ball. So, they do fit the power mold but in a less obvious fashion. If you go with the Camo version, you will get a boot bag included with the boots. 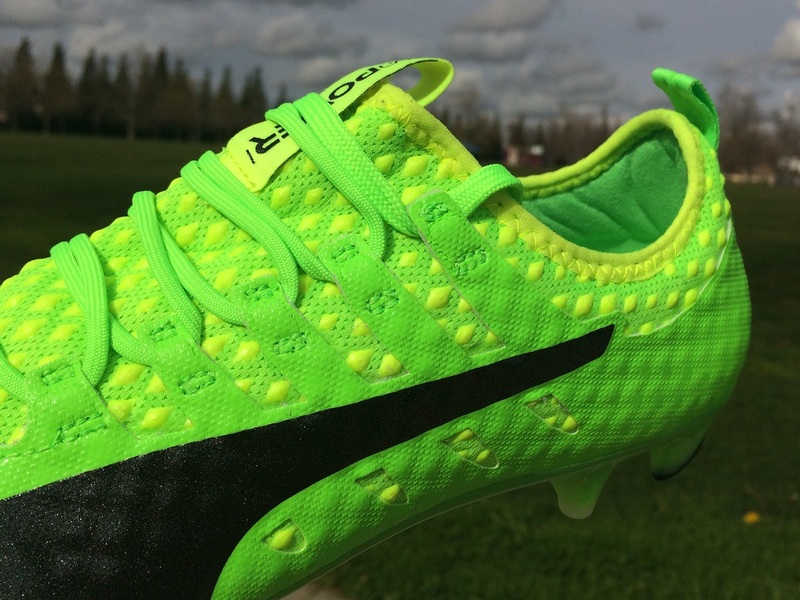 But the actual release colorway only comes with the boots. I like these a lot, I really do. The only modification I would have added to enhance the performance would be to tighten the ankle collar, or create a slightly higher cut. It would have added a more dynamic feel around the opening. But I don’t think this dictates the overall performance in any way. Some players won’t enjoy how snug the material sits around the forefoot, and players with a narrow heel might need to skip past them. Final note; Puma, get with it and include a boot bag! It would increase the positive vibes when players open a premium level boot box for the first time. If you are on the market for a pair, find them available at soccer.com. Highlight: A completely updated power boot from Puma that still follows many of the principles of its predecessors in an enhanced fashion. The upper has a lot going on, including a spandex sock fit. Category: Power, but there are surprise elements to it. Would I Buy Them: I actually think this is one of the best evoPOWER releases to date and I like how Puma has reevaluated the design. I’d definitely invest in a pair. 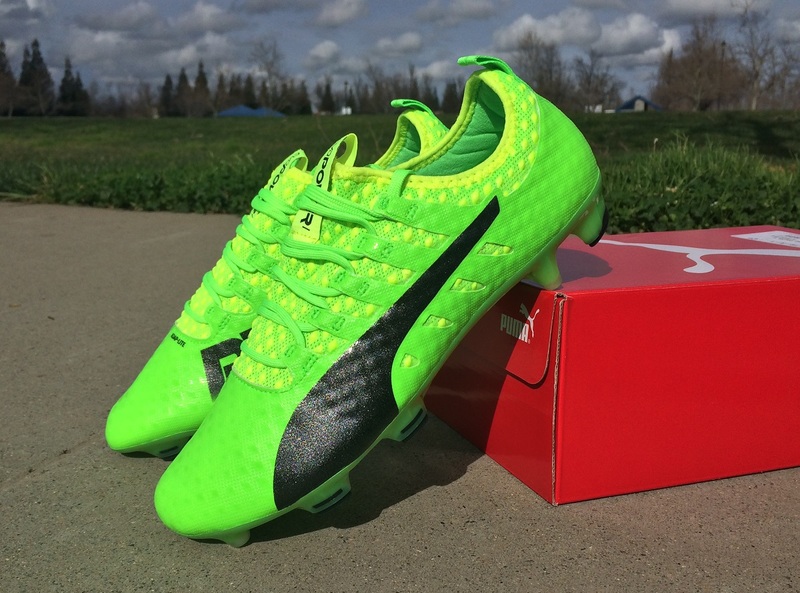 Player Position: Puma has attached an attacking mindset to them, and they hold power elements that fit the mold. But I think there is more to these, with defenders and even goalkeepers really having the opportunity to get a lot out of them. Thanks for the review I have been waiting for this one. What about the leather version? I believe it has. 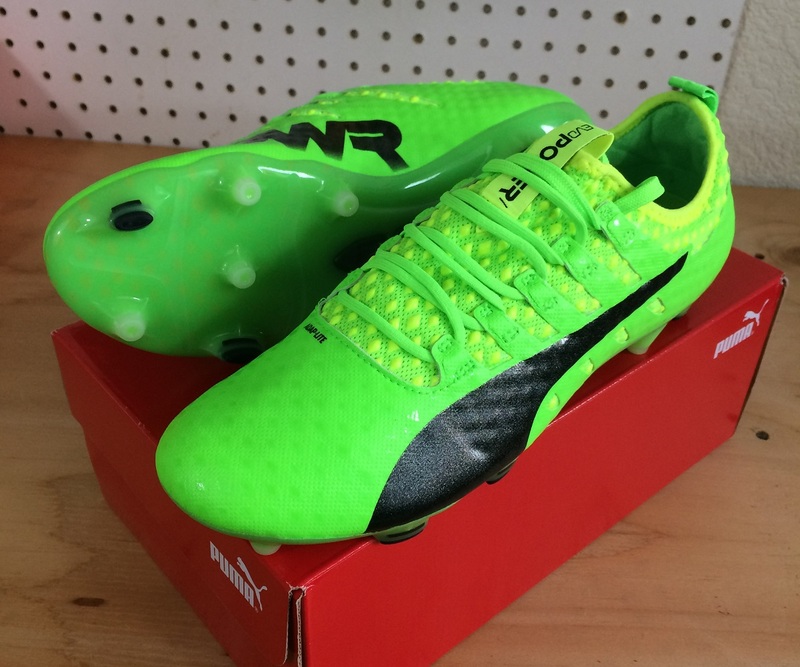 K leather upper, why are Puma and people who review boots ignore them? I haven't seen a leather version released to date. But I'll look to get a pair once they are officially released to market! could you tell us a little bit about the lockdown on these? I'm looking for a boot with great lockdown as my Nitrocharge 1.0 II AG (bought these based on your revie!great stability and lockdown) are pretty worn off. Yeah, I like the lockdown feel, although the upper material is softer and offers a looser feel than the likes of the adidas PURECONTROL or PURECHAOS. They are the boots with best lockdown. But I personally enjoyed how the material felt on these a lot more. Gotta say, other than 1.2, Evopower never fails you. Word! Evopower is the best! Awesome review! It's because of this review I went into a store to try these on rather than sticking with a trusted Evopower US11.5 and ordering them straight away online. I found my normal size way too constrictive, even the length was shorter with my toes right up against the material. Going a half size up felt like the amazing fit and comfort that I had come to expect with these boots. All the other reviews say to go with your normal size. I'm glad I read yours. Many thanks, you rock Byran! Hey! im size EU42.5 but my i have some problems with my toes and its super tight with my normal size, I tried a size 43 in a store it was super comfortable but it was lite a big at the toes like 0.2 inches from the toe to the end of the shoe. While i was wearing the size 43 i felt like my heel could come out a bit. If i buy my normal size will it stretch?? I have just bought a pair, and have the same issue. Never gotten blisters on my feet before, after 2 sessions of practice, got blisters on the back of both heels. Did you manage to find a solution ? Blister is caused by your cleats are too tight. Always buy half size bigger, for kids I would go for same fit as running shoes. after going into the game for about 30 minutes, my feet grow one more size. So wearing half size bigger, they give nice tight fit but not too tight to get blister. Buy Fifa 17 Coins, fifa 17 Ultimate Team account in our store is your wisest option.Fifa 17 coins and Fut 17 Account for all platforms can be found in full stocks with most cost-effective price and instant start.Why we’re one of the best fifa 17 coins sellers and the most professional? We were selling fifa 17 coins and fifa 17 features account for many years and we now have the premier team assisting you in case you buy fifa 17 coins. Fifa Coins online are no other fifa 17 coins on-line stores that are less expensive than us. absolutely genuine legit reseller . Looking at shoe size chart of Puma vs nike or adidas, Puma size is 1cm smaller. It's OK if you are only standing around for selfie pics. If you run around, you need 1cm at the toe for feet expansion or you will get blister or worst, restriction for blood flow makes your feet tired and get injuries easily. I bought Puma one size up. E.g Puma size 8 is the same length as other brands size 9.